In May 2014, the NFL announced that Minnesota had won its bid to host Super Bowl LII. Three finalists were vying to host the big game: New Orleans, Indianapolis and Minneapolis. After four rounds of voting and a secret ballot among team owners, it was Minneapolis that achieved Super Bowl victory. Cities in warmer climates typically play host to the annual Super Bowl, with a mere five championships being played in northern destinations throughout the NFL’s history. It has been over two decades since Minneapolis has won the league’s most coveted prize. Hosting the big game brings ample opportunity for civic boosters, international media attention, and ramped up consumer spending. 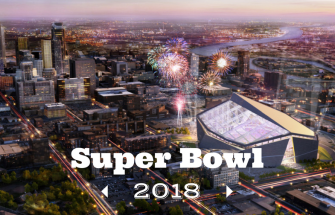 Aptly titled Built for the Bold, the bid featured plans to build a $1 billion cutting-edge stadium designed with all four seasons in mind, which sealed the deal for Minneapolis. In keeping with its winter theme, the 15-minute presentation opened with a video pitch affirming that the city is “born of the elements, a product of the robust climate and robust history of this land.” The video also featured sound bites from Minnesota celebrities like Lindsey Vonn, Adrian Peterson, Bud Grant and Andrew Zimmerman. An emphasis on community, as state taxpayers contributed $500 million to help build the stadium (half the total cost). The ease of getting around downtown, including the light rail and eight miles of skyways. The St. Paul Winter Carnival, during which the city has agreed to build its first eight-story ice castle since 2004. Plans to transform Nicollet Mall into a mile-long Super Bowl boulevard and hub of outdoor activities. In 1992, the now-demolished Hubert H. Humphrey Metrodome hosted the Super Bowl, when the Washington Redskins defeated the Buffalo Bills. The new stadium will be built on the site of the old Dome in downtown, at nearly double the square footage. The Vikings are scheduled to take up residence at the new stadium before the 2016 season begins, but until then, they will play at the TCF Bank Stadium. The big game is expected to bring 100,000 visitors to the Minneapolis-St. Paul area, and the stadium will be expanded to seat up to 72,000 of them. One side of the steeply-angled roof will be transparent, offering panoramic views and plenty of natural light. Many luxury amenities will be added, including 7 club lounges, 8,000 club seats, 2,500 premium parking spaces, up to 116 suites and 2,000 HDTVs. Among the myriad concession points of sale will be 2 team retail stores and the Vikings Hall of Legends. Much like its predecessor, the multi-purpose venue will accommodate major league sporting events, high school tournaments, concerts and conventions. 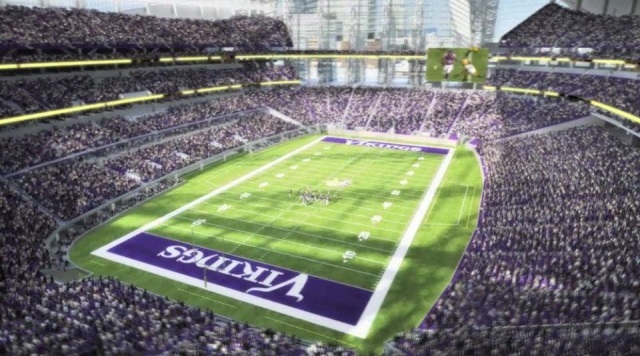 Curious about what the new Vikings stadium will look like? Flip through this gallery of rendered imagery by HKS Architects. When Super Bowl LII comes to town, how you will celebrate? Share your game day plans in the comments below.